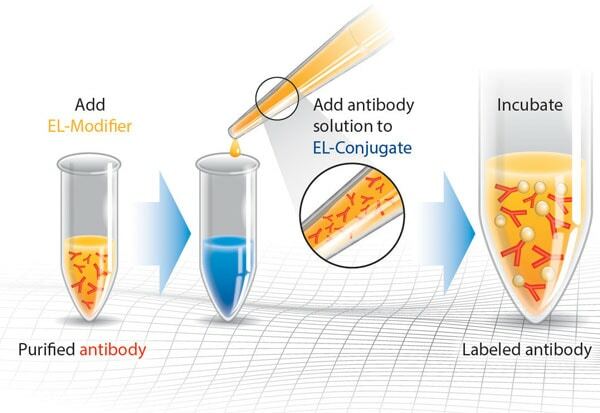 Abcam’s GOLD Conjugation Kit (20nm, 20OD) (ab188215) allows antibodies or proteins to be covalently attached to ultra-stable* Gold nanoparticles at very high OD quickly and easily. The hands-on time for the Gold conjugation procedure is about 2 minutes and the conjugate is ready to use within 20 minutes. Our Abpromise guarantee covers the use of ab188215 in the following tested applications. ab188215 has not yet been referenced specifically in any publications. Publishing research using ab188215? Please let us know so that we can cite the reference in this datasheet. There are currently no Customer reviews or Questions for ab188215.